Flame – a passionate red color that electrifies the entire pallet of Spring 2017 Fashion Color Report. Red jumpsuits, pumps, flamboyant dresses, and blouses are the eye-catching fashion garments that certainly will strike the street style this upcoming season. 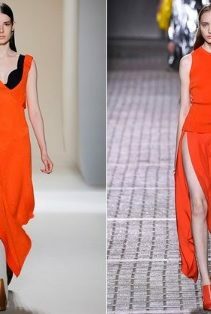 No matter what fashion garment a woman chooses to wear in flame color, this red based orange hue speaks out appealing, seductive, and provocative.